As has been established previously, pancakes are very serious business in our house. Though we have a couple of good solid base recipes, we are always on the lookout to try something different. As always with new recipes, you win some and you lose some. This one was a winner! The interesting thing about these pancakes is that you use yeast. I’ve seen a lot of pancake recipes, but this is the first one I’ve ever seen that requires yeast. It doesn’t really rise, per say, but you do end up making something that is more of a dough, not a batter. It’s more like frying bread dough. You can try to thin the dough with a little bit of milk, but it doesn’t seem to make much of a difference, so I don’t know if it is even worth it. Basically, the whole thing is just very different than making regular pancakes, so you can’t really expect the batter to be the same consistency. The other very appealing thing about these pancakes is apple slices! Sure, you could put apple slices on any pancake, or you could put something besides apples on these pancakes, but they looked so good in the recipe, that I just went with it and it worked. The yeast makes this like a chemical reaction, changing the consistency of things. I think it actually makes the dough sweeter, but it also makes very thick pancakes. You have to make sure you flatten them a lot when you flip them over. 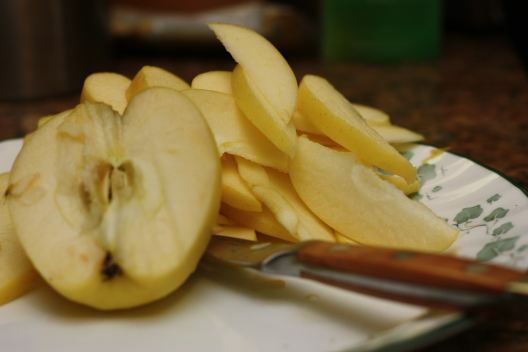 Also, because they’re so thick and chewy, they are hard to cook through, especially where the apples are. So you want to be careful to make sure they aren’t too doughy in the middle. These things are rib-stickers! Very filling, in addition to being delicious. The apples are a really good idea, though as I said, you could really do that on any set of pancakes. These won’t replace our baseline pancakes, but they are definitely now a part of our normal pancake rotation. You do have to start them the night before, so they take some pre-planning. The original recipie can be found at Vegan Yum Yum (which is pretty awesome by the way). Mix the dry ingredients first, and then mix in the milk, oil and egg. Cover the bowl with plastic wrap and leave it in the fridge overnight. 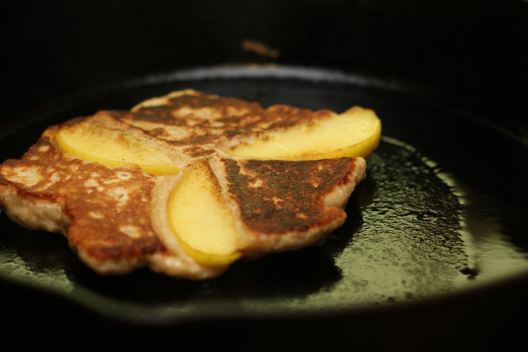 If you’re going to be doing the apples, try to cut them thin so the pancake underneath will still get some heat. The rest is just like making regular pancakes. Pingback: Lonely Eats the Pancake Maker | Is this thing on?